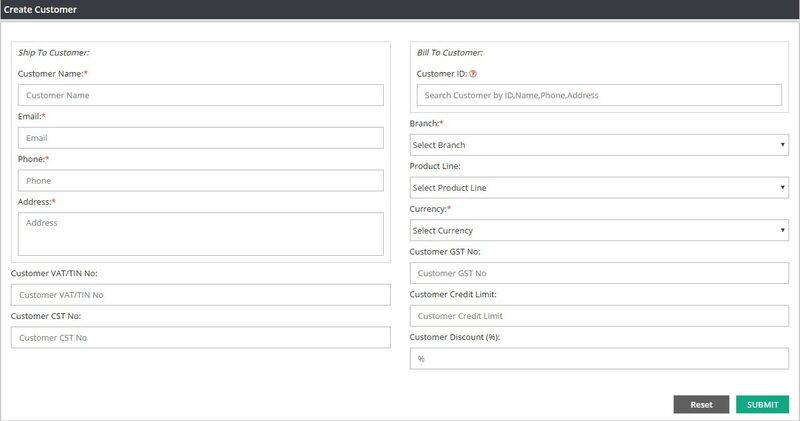 Use create customer screen to create customer records. A customer can be a person or business who buys goods or service from your company. If any of your customer has got a different billing and ship to address then create a separate record for each and you must create the Bill-To customer record first. Navigation : From main menu select ‘Customer & Vendor’ and then click on ‘create customer’. Enter required details and then click on SUBMIT. New customer record will be created successfully. Enter the customer name here. Customer name should be unique. You can not create different customers with same name . If you have two customers with same name ABC Ltd., then you can create these customers as ABC Ltd Delhi and ABC Ltd. Mumbai but not ABC Ltd for both of them. Enter the email address to communicate with customer over the email. Please enter complete mailing address for the customer. This will be useful for delivering goods to them. Please enter the details if applicable. If you do not have any information to enter on these fields, then you can keep these fields blank. Enter or select the bill to customer name on this field only when you are creating a ship to customer record which has got a different location or branch for billing & payments. *If your customer has got same address for delivery and billing, then this field is not applicable for you. *If your customer has got different addresses or locations for receiving the goods and billing, then you will have to create two customer records for them. One is bill to and another one is ship to. We suggest you to create Bill to customer ID first. Please select the branch from the drop down list if you are a multi branch company and you want to access this customer from one particular branch. *If you are a multi branch company and you want to access this customer from all your branches, then please select ALL from drop down. *Ignore this field if you are a single branch company. Please select the product line if you want to sell specific group of products to this customer. Product line is made up with group of similar products for various reasons. Please select the default currency from currency list for this customer. Please enter customer’s GST number on this field if it’s applicable. Through this field you can set a credit limit for all your customers. For an example, as a business if you don’t want to sell any further products to Customer -A, when they have an outstanding invoice total which is more than$10000. In that case please set that limit ($10000)on this field. Once they cross that limit amount, system will not allow anyone to process any further invoice for Customer-A unless you increase the credit limit amount on this screen. If you do not want to set any credit restriction for your customers then please keep this field blank.